Reading Mentors/Tutors Needed for 2018! 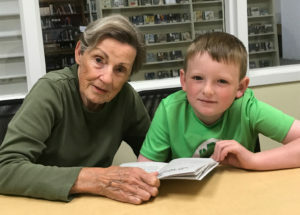 Jean Woodson tutors Chase Pooley at the Rockbridge Regional Library. Trained tutor/mentors work with elementary-age students who are struggling with reading. They find fun ways to encourage students’ interest in reading and help them improve their reading skills. Students are referred through their schools and participate in tutoring with the permission of their parents. All services are free of charge. Volunteer tutors receive training in the fall and commit to tutoring once a week for about an hour throughout the school year (not including vacations and holidays). Lesson planning takes about 30 minutes per session. Prior teaching experience is not required. A high school diploma and attendance at the three training sessions provide tutors with the tools they need to be effective. Tutors and students agree on what days of the week they will meet and at what times, usually during the school day or immediately after school. Students and tutors meet at school or in the Rockbridge Regional Library. For more information about becoming a tutor, call or write Susan Bushnell, Youth Literacy Coordinator, Rockbridge Regional Library, 138 S Main Street, Lexington, VA (540) 463-4324, X 105, sbushnell@rrlib.net. The Youth Literacy Program is supported in part by the United Way and grants from Washington & Lee University and the Community Foundation of Rockbridge, Bath and Alleghany Counties.